You'll be £32.00 closer to your next £10.00 credit when you purchase The World of the Battleship. What's this? This new volume is intended to present a genuinely global vision of the development of world’s battleships. 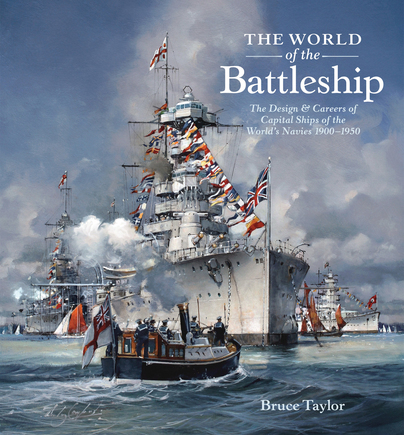 In a collection of chapters by experts from around the world, the design, building and career of a significant battleship from each of the world’s navies is explored in such a way as to illuminate not just the ships but also the communities of officers and men that served in them and, more broadly, the societies and nations that built them. While ships from the Royal Navy, the US Navy, the Kriegsmarine, the Imperial Japanese Navy, the Marine Nationale and the Regia Navale are given significant coverage, so are those from the smaller navies, for example, Austria-Hungary, Russia and Turkey. Each chapter explains the origins of a particular ship, her importance as a national symbol and her place in the fleet. The genesis of her design along with particulars of her protection, armament and propulsion are covered and the construction process and launching described. The ship’s complement and organisation are detailed, and daily routine and watch-keeping explained, and how this varied between peace and war. Life onboard – eating and sleeping for officers and ratings, discipline, pay, morale, pets and mascots – are covered as well as a full account of the ship’s career, so that the distinctive character of each vessel and navy emerges. This is a highly original and significant book on the great capital ships of the world. Overall, a fascinating journey, different navies, different nations, and different times. A significant book on the great capital ships and their role in the expression of a nation’s seapower. This work is a landmark in naval history and among the most important books to appear in the field of naval warfare for many years.